The Aerial Guys offer a comprehensive TV aerial installation and TV aerial repairs service. So, whether your TV picture is pixelated or breaking up, or you are setting up a brand-new TV installation and set-top box, The Aerial Guys can get you up and running in no time. In most cases, The Aerial Guys can ensure an expert TV aerial engineer is on site that same day. Our friendly and professional engineers will assess your TV aerial installation or repair requirements and give you a fixed price quote before they get to work. That way, you know exactly what you will pay upfront, with no hidden costs. All of our experienced aerial engineers carry a complete range of TV aerial equipment. So, when we say we can fit it or fix it that same day, we really mean it! If you want your Freeview installing or need an aerial for your new house, The Aerial Guys are here for you. Do you want a HD distribution package or maybe Broadband TV package installed? We aim to deliver the most efficient installations and repairs possible, saving you time and money in the long-run. With The Aerial Guys, you’ll always get the best possible service! Book your appointment today on 0800 0920222. Can you repair my TV aerial? When The Aerial Guys talk about TV repairs we don’t physically carry out repairs on your TV aerial. We’ll assess where the fault in your picture lies. If we can adjust your existing aerial and cabling to improve your picture then we will. However, if your aerial has been damaged, we will need to replace it. Don’t worry though, The Aerial Guys carry a wide range of specialist equipment, so we can often make same day repairs. Can you connect several TVs to my aerial? Yes, we can. In essence, you can have as many TV's in as many rooms as you’d like connected to your existing aerial. These are called extra points and, depending on how many extra points you need, The Aerial Guys can fit a suitable sized amplifier to split the aerial signal. Ask one of our friendly and knowledgeable engineers for more details and we’ll have you enjoying multi-room viewing in no time! Why is my TV reception so poor? There are any number of factors that could be causing your poor TV reception. These can range from adverse weather conditions, to signal obstructions (like trees and tall buildings) and your distance from the transmitting mast. 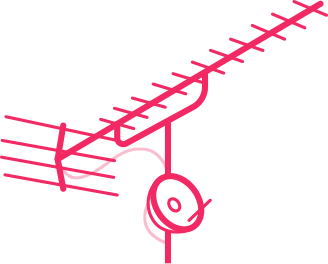 The Aerial Guys can assess your signal strength and provide guidance and practical solutions to help you to get the most out of your TV viewing experience. Speak to us today for more information. Most Freeview TVs and set-top boxes allow you to check signal strength and quality for each group of stations (also known as a multiplex). This is usually accessed through the menu button – see your handbook for details. 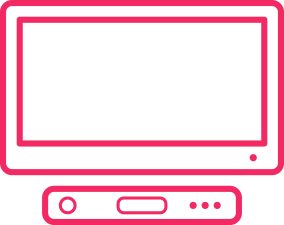 If your equipment suggests signals are too weak, you’ll need to check that Freeview reception is available in your area by using the postcode checker provided by Digital UK.